Production bottlenecks have left Tesla running behind in ramp-up plans for the Model 3. Tesla reports third quarter earnings on Wednesday after the market closes. All eyes will be on news of the mass-market Model 3 and the electric car's slower-than-expected production. What with SpaceX launches, Boring tunnels, and even dark warnings about the threat of artificial intelligence, CEO Elon Musk already has a few irons in the fire. But Tesla is the center of the Muskian universe, and the second half of 2017 was to be the test of whether he could make enough Model 3s, and make them fast enough, to justify the billions of dollars already spent. So far, things haven’t been going that well. Wall Street analysts will likely have some questions. 1. What exactly are the "production bottlenecks" and are they primarily at Tesla’s gigafactory? 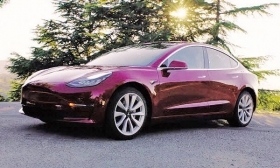 Tesla reported earlier this month that it had made just 260 Model 3 electric sedans in the third quarter, well below its 1,500-unit forecast, citing unspecified "production bottlenecks." While much of the speculation has centered on the company's auto plant in Fremont, California, its gargantuan facility in Nevada—where the batteries are made—is also a critical part of the production story. In an August letter to shareholders, Tesla stressed that the Model 3 drive units, as well as battery packs made with new cells, are being built on new manufacturing lines at the Gigafactory outside Reno. More telling is that Musk, 46, appears to be spending more time there, tweeting Thursday that he’s been camping on the roof “because it was less time than driving to a hotel room in Reno.” And when he said camping, he wasn’t kidding. Meanwhile, Tesla shares have returned 50 percent so far this year but on Monday closed 6.5 percent below the Bloomberg consensus one-year target price. 2. How much cash has Tesla spent? Tesla had roughly $3 billion in cash on hand at the end of the second quarter and tapped the debt markets in August, raising $1.8 billion in its debut bond sale. The company has always expected to spend heavily in the second half of the year on the Model 3 as kinks in the lines are worked out and production accelerates. "We hope for a more detailed plan for the company's expected cash burn," wrote analyst Jeffrey Osborne of Cowen & Co. in an Oct. 19 research note. The company "still has not provided a realistic plan for [capital expenditures] that reflects both the company’s ambitions as well as cash generating ability." 3. How close is Tesla to completing plans for an assembly plant in China? In June, Tesla said it's "working with the Shanghai Municipal Government to explore the possibility of establishing a manufacturing facility in the region to serve the Chinese market" and expected to more "clearly define our plans for production in China by the end of the year." If Tesla could set up a plant in China, it could compete better with local rivals because it would eliminate a 25 percent import tariff that makes Tesla’s cars more costly for Chinese consumers. 4. Is labor strife affecting production at the Fremont factory? Tesla has roughly 33,000 employees globally, a figure that ballooned after the carmaker acquired SolarCity in November 2016. And the company still has more than 2,300 job openings listed. The United Auto Workers is trying to organize some of the more than 10,000 employees at Tesla’s Fremont facility. This month, the company reportedly fired hundreds of workers, citing annual performance reviews. The UAW filed an unfair labor practices claim with the National Labor Relations Board, alleging the company harassed, intimidated and eventually fired some workers who had supported unionizing. Tesla has denied any wrongdoing. 5. What's up with Autopilot? Musk has promised that Tesla's driver assistance platform, known as Autopilot, has the hardware necessary to enable full self-driving. But this year has seen repeated turnover on its Autopilot team, and there's no sign of the promised “Enhanced Autopilot” features, let alone the "Full Self Driving" goal he unveiled a year ago. Musk also promised an autonomous cross-country drive from California to New York by the end of 2017 but appeared to push that timeline back a bit on his last earnings call. Tesla used to be seen as a leader in autonomous driving. But with the Autopilot timeline slipping and many other automakers promising 2018 vehicles with similar features, expect a lot of questions about Tesla's road map to full self-driving.